Beston automatic waste segregation machine mainly consists of uniform plate feeder, automated sorting system, large waste crusher, comprehensive winnowing machine, rotating screening machine, magnetic separator, gravity separator and so on. 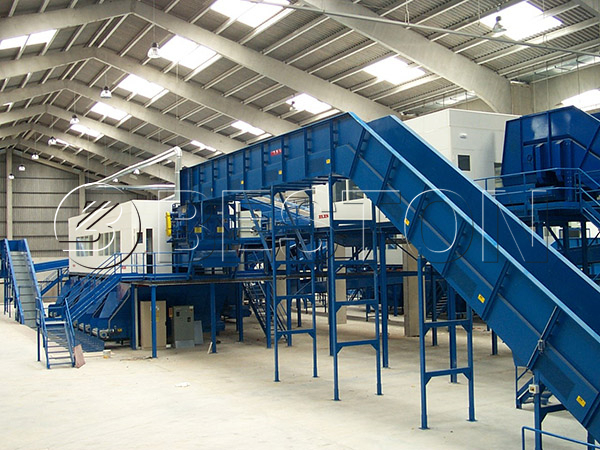 This automatic sorting machine is widely used for municipal solid waste disposal. Due to the high efficiency, easy operation and high automation, our automated waste segregation system is getting popular among the investors around the world. Why Is Beston Automatic Waste Segregation Machine A Great Invention? 1. Waste separation technology is a breakthrough in waste recycling industry because it can fully recycle the municipal waste. 2. Using it can achieve the goal of waste minimization. Basing on the statistical data, the amount of waste can be reduced by 50%. 3. It does no harm to the environment. It can recycle harmful waste like waste battery. Thus it can avoid water and soil pollution. In addition, using the automatic sorting machine can avoid the secondary pollution caused by burning and landfilling. 4. It can achieve the cyclic utilization of waste. After the sorting process, you can get a lot of useful materials from the waste, and those materials can be reprocessed. a. You can convert the plastic waste into oil by using waste plastic pyrolysis plant. Moreover, plastic oil can be refined by the waste oil distillation plant. b. The sorted organic waste is a good material to make fertilizer. c. As for the earth and waste bricks, they are suitable to make new bricks. 1. Fully automatic operating system can avoid the manual operating mistakes. 2. The perfect sealing system can make sure that the plant is working in a sealed condition. 3. The special odor control system ensures the workshop is suitable to work. In this way, you can make sure that the worker has a safe working condition. 4. The PLC system can monitor the whole working process, which can ensure that the plant is working in a safe environment. 5. The design and configuration are adjustable according to the garbage component of different locations and countries. As the professional manufacturer and supplier, our company offers several different models of automated sorting machine available. They are BFX-100, BFX-200 and BFX-400. And these machines have different parameters and daily processing capabilities. What’s more, Beston waste separation equipment has been exported to Uzbekistan in 2017. At the same time, our company has established a long-term relationship with them. If you are going to invest in this machine, please contact us to get a free quote online.